The artistic significance of the Tosho tsuba represents the Japanese awareness that could be the origin of aesthetic expression of the koshirae and the sukashi-tsuba. 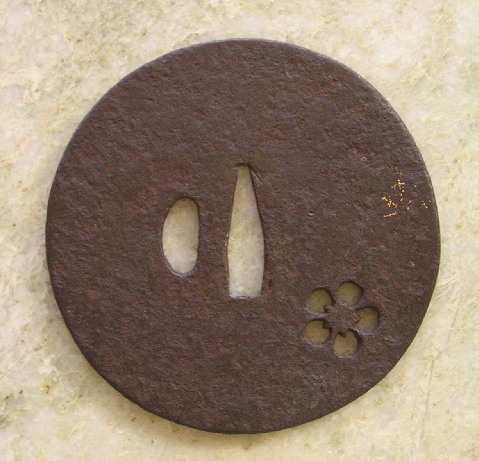 Ko-Tosho Tsuba in excellent condition. From end of the Kamakura Jidai until around the early Muromachi Jidai period, ca 1400-1450. A well worked and hammered plate with the edge showing iron bones. The single ume(Plum) flower placed boldly on one side of the guard is neither naive nor plain, and very well cut. Samurai were probably attracted by the purity and life of the ume blossom and its delicate nature. It represents a kind of ultimate beauty and gentle mood evocative of a sense of compassion of the samurai. The strong, softly lustrous metal, the placid ume blossom, the large Hitsu-ana, and the antique-looking chisel marks around the Hitsu-ana are all characteristic indications of early-Muromachi period works (ca. 1400). 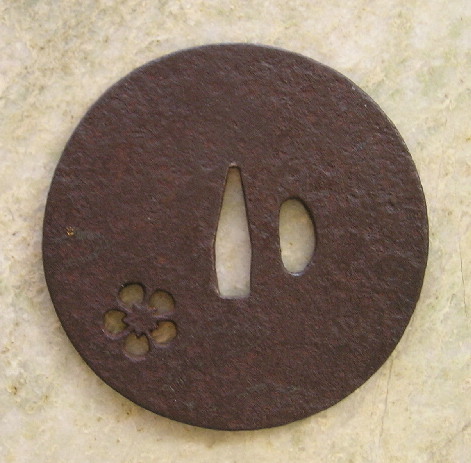 The Hitsu-ana, made when the guard was first produced, suggests that it is a work of the time of Yoshimitsu. There are slight traces of gold nunome, one on each side but neither identifiable (possibly added later).